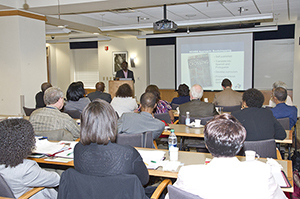 The third annual Race, Ethnicity, and Poverty (REAP) Summit took place on June 11, 2015 and June 12, 2015 at the Urban Institute in Washington, DC. The Summit brought together approximately 50 researchers, practitioners, and funders from across the nation to discuss the theme of the Summit “Connecting Race, Ethnicity, and Class for Collective Impact”. The goal was to place greater emphasis on building collaborative working relationships and broaden the impact on race-related research, equity-based policy, and practice. This collaborative approach is intended to create synergies in our institutional, local, municipal, state-level, and national-level work. country gathered for the second summit of Race, Ethnicity and Poverty (REAP) centers held at the University of Pittsburgh’s Center on Race and Social Problems (CRSP) on June 5th-6th, 2014. The organization was founded with the mission to identify and locate existing REAP centers, determine what these centers do and how they function as research entities, and create opportunities for future collaboration among centers. The event brought together researchers and practitioners from centers housed in universities such as Stanford University, University of Texas at Austin, University of Michigan; as well as independent centers including: the Council on Social Work Education Center for Diversity and Social & Economic Justice, the Joint Center for Political and Economic Studies, and the Urban Institute. In June 2013, the Center on Race and Social Problems at the University of Pittsburgh School of Social Work held the first nationwide summit to bring together centers across the nation whose focus is race, ethnicity and poverty. More than 30 researchers and center directors from across the country participated. The summit aimed to identify and locate existing Race, Ethnicity and Poverty (REAP) centers and determine what these centers do and how they function as research entities as well as to create opportunities for future collaboration among centers. Twenty-six centers were identified as focusing primarily on African Americans. Seven centers were identified as focusing primarily on Hispanics. Three centers were identified as focusing primarily on Asian Americans. Five centers were identified as focusing primarily on Native Americans.